✈1st Day (01/10/2017) - Early morning arive at BKK Airport (Bangkok) & transfer to Pattaya. Evening ALCAZAR Show. ✈2nd Day (02/10/2017) - After breakfast whole day CORAL ISLAND Tour. 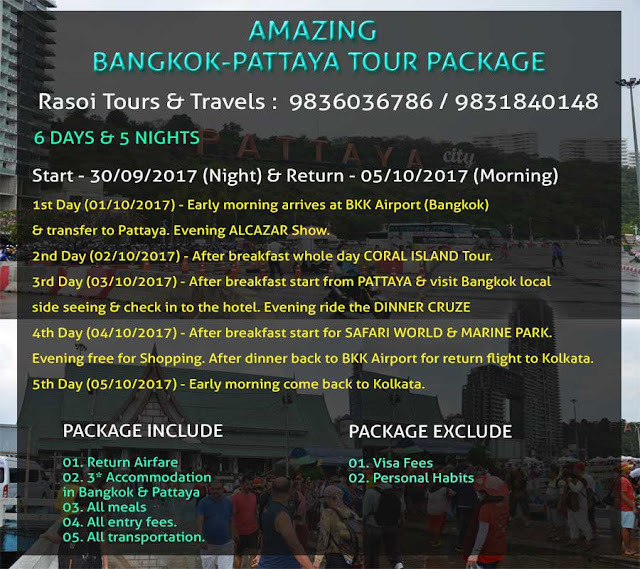 ✈3rd Day (03/10/2017) - After breakfast start from PATTAYA & visit Bangkok local side seeing & check in to the hotel. Evening ride the DINNER CRUZE. ✈4th Day (04/10/2017) - After breakfast start for SAFARI WORLD & MARINE PARK. Evening free for Shopping. After dinner back to BKK Airport for return flight to Kolkata. ✈5th Day (05/10/2017) - Early morning come back to Kolkata. 1st Day (01/10/2017) - Early morning arive at BKK Airport (Bangkok) & transfer to Pattaya. Evening ALCAZAR Show. 2nd Day (02/10/2017) - After breakfast whole day CORAL ISLAND Tour. 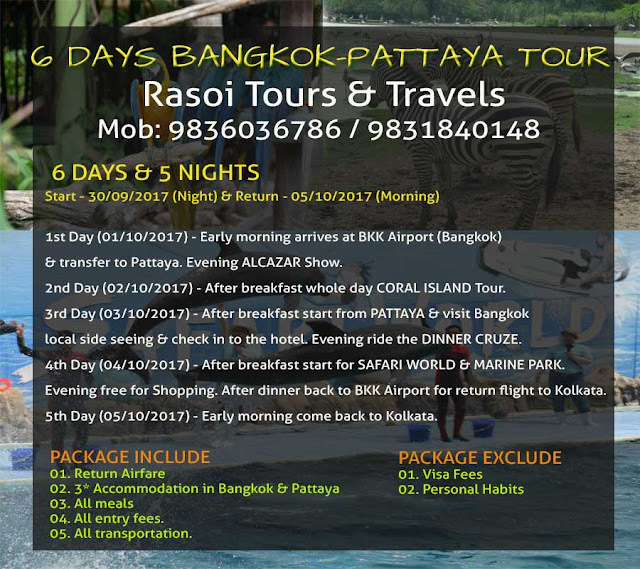 3rd Day (03/10/2017) - After breakfast start from PATTAYA & visit Bangkok local side seeing & check in to the hotel. Evening ride the DINNER CRUZE. 4th Day (04/10/2017) - After breakfast start for SAFARI WORLD & MARINE PARK. Evening free for Shopping. After dinner back to BKK Airport for return flight to Kolkata. 5th Day (05/10/2017) - Early morning come back to Kolkata.